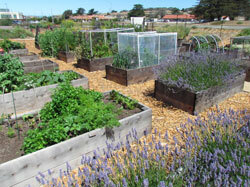 The garden is located on Imjin Parkway between 2nd and 3rd avenue in Marina, California. 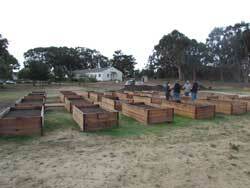 The Marina Tree and Garden Club has an agreement to maintain 18 of the raised beds on behalf of our club. The larger project was created by Iris Peppard, of Everyone's Harvest, in conjunction with Goodwill Industries that owns the property. This project was funded in part by grants from the Department of Agriculture and is a great opportunity for various groups and organizations to grow food in a community based setting. The agencies in the garden are HOPE Services, the Veterans Transition Center, The Community Wellness Center, Shoreline Culinary Arts program, and Marina Tree and Garden Club. Everyone's Harvest has service learning opportunities for students through California State University Monterey Bay. 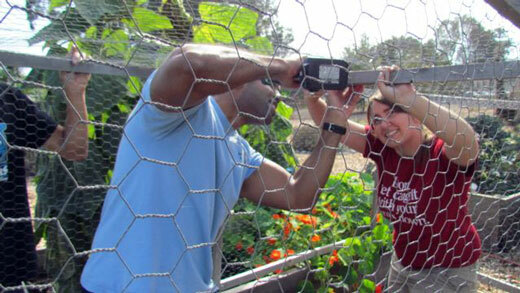 Student service learners have been an integral part of developing the garden. 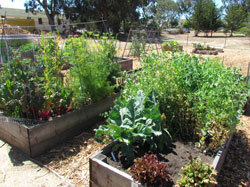 This has fostered a deeper respect in students for how to grow food and maintain a garden. Program days are held Monday, Wednesday and Friday from 10-noon. All of the sturdy redwood planter boxes have gopher wire bottoms and are filled with a good vegetable growing soil mix. Water is provided on site as well as basic hand tools. A small fee is required to secure a bed for a (renewable) 1 year term. The collected fees go towards future improvement projects. There are opportunities to work on larger garden projects, such as composting, sheet mulching and landscaping in the garden. 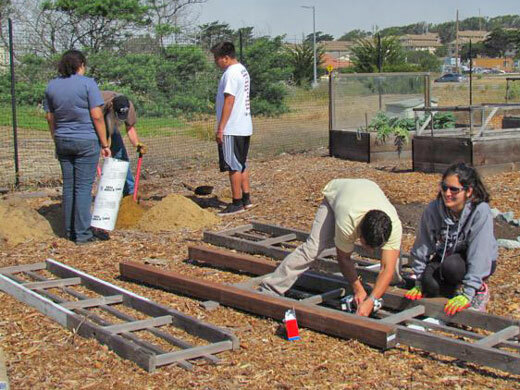 Novice and seasoned gardeners alike come together to share knowledge and enthusiasm in one of the largest community garden projects on the Monterey Peninsula. The completed forms below are required for adopting a bed. Please follow the instructions on the form, include your fees for membership and mail in your application. You will be contacted by one of the members of the Shoreline Garden project committee to let you know if a bed becomes available. Results from the UC Santa Cruz Biodiversity in Urban Gardens Project Report Summer 2017 with Monika Egerer from the Environmental Studies Department in Santa Cruz. This report covers beneficial insects, pollination, pest control and water conservation, and ultimately foodaccess and well-being for gardeners!